I looked at the post and knew, just knew, many purists were going to comment 'Dude, that is hideous', or 'I guess if you like to look like one of those guys' and the other myriad of comments that come from the question 'What do you think?'. There were many other comments that purists in the Roadster community thought of the wing on my car. I went from excited to practically embarrassed to drive the car around. I immediately started shopping for a trunk lid without a wing to replace the certainly hideous appendage my car had grown. I shopped for a couple of weeks, some people had trunk lids to sell me, and overall I wasn't getting my Elephant Man car fixed for less than $300 to $400. I then looked at the car and thought 'I like the wing.' Sure it is a bit gaudy but it just fits the car - I guess that's why BMW offered it as an option. I then thought 'Why am I going to spend money because others don't like it? I am the one driving the car.' In the end, I have decided to keep my grotesque looking M Roadster with the hideous rear wing and enjoy the car. truck) and put big tires on it and 50% of the people don't like raised cars. They modify it outside, inside and under the hood and people ask why the car wasn't kept original. Some keep their cars perfectly original and many respond about how boring the car looks and why haven't they modified it? Essentially, you aren't going to make everyone happy. In fact, probably most won't like what you do to your car because it isn't what they would do. I am 52 years old soon and maybe with age I have learned to not care what others think or maybe I have learned if I like something then why not do it? That's the thing about cars. Really, no two cars are alike and not everyone is going to like your car. But isn't that half the reason cars are so cool? I belong to many automotive related groups on different social media. From old cars to new cars, cars that people see on the highway to ones sitting in someone's garage in a 1,000 pieces, particular brands, types and even colors - you name the category there is most likely some car group out there related to it. Most of these groups require a rule that when broken is dealt with swiftly and with justice. What makes me write about these groups along with the above rules is that I theorize that if we could get everyone to be car fanatics most of our social, racial and other issues could go away. One gentleman wrote: I believe if all people became car fanatics world peace would be achieved. I have seen, and know first hand, that car people just don't see race, gender, sexual orientation, or the host of other ism's that plague social media and the news today. What we see are cars, cars and more cars. While attending a weekend Cars and Coffee meet if a beautiful 69 Pontiac GTO Judge shows up I can tell you that if Christie Brinkley (for the older crowd), Gisele Bundchen (for the younger crowd), Vladimir Putin, President Obama, Heisenberg of Breaking Bad fame - pretty much anyone who steps out of that car will be just background as we all rush to see the car. (Note: Jay Leno and Jerry Seinfeld are the exceptions to the above rule as they are car guys' car guys). On a good day we might eventually realize who the driver is and on a normal day after the person drives away someone may say 'Wasn't that Matt Damon?' and others would say 'I didn't notice.' It's just the way we are. Those of you not stricken with the car bug may say it is because we are shallow and simplistic thinkers and can only focus on one thing at a time. I can assure that is not true because: First, many car fanatics are women - we know women can focus on more than one thing. share of looks and comments). So we don't care if you are a 1%'er or only have about $.01 in your pocket. Additionally, you don't even have to own a great car to become a member of the group, if you love cars like we do, then welcome to our club! All this is true because we have our priorities straight. Cars are not human and therefore don't have built-in prejudices and since we live for cars we too have lost that built-in prejudice. We see the world through paint, wheels, suspension, turbos and a host of other inanimate objects. Those inanimate objects only worry that the parts they are connected to continue to do their job - regardless of the color, brand, store the part came from. As a car crazy person that's how I see the world as well. I don't care where you came from, what you do for work, your car is what I want to know more about. Will you get one? Will you? You know, the Lexus 'December to Remember Event'. Did you get a new Lexus? Will Santa deliver a brand new white, or maybe his personal red, Mercedes? Maybe a new Acura fresh from the 'Oh what fun it is to drive' specials. BMW, Ford, Audi - all manufacturer's believe only a Neanderthal wouldn't purchase a brand new car for Christmas. How many people actually purchase a car for Christmas? Do you know anyone that has ever been given a car to celebrate the First Noel? Let's go one step further, how many people do you know that received a brand new $50,000 Lexus or $65,000 Mercedes as a gift? Some teenagers get 'new' cars for Christmas, new to them that is. But really, the car was something they would get anyway, Christmas just makes it more fun. The question I am asking is do you know people who purchased a new car because, well, an ad on television said that if you love that special someone you will buy her a brand new, very expensive, very fancy car and deliver it to her with a huge bow on top. I have seen this once in my life. In the late 80's I sold Ford, Mercury and Subaru's in a small town. A gentleman from New Hampshire had a ski house just 30 minutes north of my town in Vermont. He had just purchased a new Subaru wagon to help him get back and forth to New Hampshire. His wife loved another Subaru on the lot. The next day he called and said he wanted to buy the other car for his wife and deliver it as a Christmas present. I purchased a giant bow and on Christmas Eve he arrived, picked up the car and headed up to his ski home to deliver to his wife. I am sure she was surprised, he was happy to purchase it for her and I liked the commission. However, a new Subaru isn't the same price range as the $90,000 Mercedes SL or AMG sedan. Why would I never buy a car as a Christmas gift? ends up on the bottom of the list. We are currently driving a Mini Cooper Countryman because I didn't know she would like one. So reason one to not buy a new car for my wife? I would purchase the wrong car. Heck, I can't pick out a sweater she likes much less a car. Second, the color that I love and the one she loves is of course the same, not really. Give me a gorgeous burnt orange, dark burgundy colored car and I would be a happy camper. She on the other hand likes aqua blues, mint greens and other colors (and if you are reading this honey - I know I probably have these colors wrong - remember - small male mind). feeling that many car brands brag about. I think we purchased our last Ford a few years ago because all Ford's now have that tight driver's center that I guess most males like. And how about how it drives? More power! Kidney breaking suspension! The ability to make a passenger throw up when I take a corner is how all cars should be made. I want to know heads versus tails when I drive over a dime. My wife, not so much. Yes, she likes a car that drives nice, is sprightly but the race car turned road car is not on her Christmas wish list. Finally, I said that we don't have the money but let's assume I do. How in the world, unless you are Bill Gates, hide a $65,000 purchase from your spouse? Even if you manage the books, somehow, somewhere she is going to say 'Hey, remember that CD we had? The bank says we cashed it in. Do you remember doing that?' There is no way I could get away with it. I once bought my wife a $10 gift while traveling and Visa called to confirm the purchase. So she found out that I had bought something for $10 in the state of Washington. Yeah, a $70,000 purchase is not going unnoticed. Again, dear, if you are reading this, you may be surprised to know that you are not getting a new Range Rover, Jaguar, or Porsche for Christmas. I may get some jewelry and that perfume you want, but don't run down to the garage in the morning unless you want to see the two cars that are already sitting in there. How about a sweater? Are you someone who purchases expensive cars for Christmas as a gift? Do you know someone who does? Would you dare? This is something I think about each time I see one of the perfect families walk out of the house on Christmas morning, standing in fake snow, hair all perfect (even though it is 5 in the morning) with a surprised face for the new car in the driveway. Maybe it is just jealousy that makes me ponder this. Maybe I just don't get it. That's the thing about buying a car for someone as a gift or even as a necessity, bring that person with you, it is too personal a purchase to just pick one out for that special loved one. I wish you all a wonderful Christmas season. ‘It was the best of times, it was the worst of times’. No real reason for that line but it is required with the title. Most, if not all, of you know that I own and regularly drive 2 BMW 2002s. A 1974 and a 1975. These two cars while beginning life as family sport sedans clearly lived in different parts of the country with different owners who had different ideas of what car ownership meant. How I came to own these two cars that are nearly opposite, even in color, I still sometimes wonder myself. Having driven wagons, sedans, and small SUV’s coupled with a new driver on the way, meant it was time for me, the car guy, to get a car guy car. I wanted something I could drive every day, be cool, and handle well. After much consideration my dream was to be a BMW 2002 owner. Now Birmingham, Alabama is certainly not a mecca for small, unique, vintage German cars so my search went to the web with the entire U.S. my location. Hemmings, Craigslist, 2002 forums became my morning reading list. If I found something interesting I would post on the forums for advice where I would get frank responses such as: ‘I wouldn’t buy a car from them.’ ‘That price is crazy.’ ‘No’. However, my questions did not go unnoticed. One day I received an e-mail from a guy in St. Louis, MO saying he has a car for sale. He includes a few dark pictures of the car. St. Louis has snow, right? This thing will be a rust bucket, but I will at least listen. He promises more pictures that weekend. At the same time I have located a 1967 1600 with a potent 150HP Metric Mechanic 2.0 liter engine that has caught my fancy. I call that owner and the car is exactly as described. No serious rust issues, really pretty upgraded interior, with a great motor. Being about the same price didn’t help. Regardless of which car I went with, I was going to modify the Hades out of it (Sorry about the language). I went with the 1974 because it met my needs at the time. When Ivory, that’s what I call her, got home I realized that the car is simply stunning. The paint looks better than new, the interior carpet isn’t faded, no cracked dash, the seats recovered and re-stuffed using original BMW materials could not be overlooked. Add to that the larger carburetor, the upgraded sway bars and the car was simply perfect and there was no possible way I could modify it. If I did the car gods would surely send down a bolt of lightning and destroy my points so that the car would never run again. So I drove her as is all the while questioning should I modify the car or not? A couple of years later I am driving home and I see what has to be the drug addicted, party going, live life to the fullest Black 2002 in the country. She has an obnoxious exhaust, doors that don’t shut and an interior that Satan himself couldn’t make look worse. In short, I make a friend and soon negotiations for purchase happen. A good price is agreed on. The car runs but can’t propel itself forward so we ‘tow’ it home (which means on flat stretches of road and downhill the car can move itself, uphill his friend’s Wagoneer will pull it). Ebony, that’s her name, is officially mine. Eeny, meeny, miny, mo, it must be spark so there I’ll go. A new starter coil, conversion to electronic points and voila – she runs AND drives. Half the lights work, windows don’t roll up or down, wing windows partially work, seats can’t be moved back and forth and there is no ignition key or tumbler or trunk lock. A few turns of a screwdriver, some used and new parts and the car runs and drives well. I have me a daily driver. So the Tale of Two cars continues on. It amazes me that that two cars that are nothing alike except for make and model can make the same owner grin ear to ear on each and every outing. I guess that is the thing about cars, like puppies, they just find a way to get into your heart. set of very funny ads of people walking past tan Malibu's and never noticing them. Some cars people would run into because they were so invisible. One ad, about bank robbers hopping into a tan Malibu and the police running by them was done so well it has become internet folklore as being true. (http://preview.tinyurl.com/nkdravu) I have to say I was proud of GM for the willingness to make fun of their own car (I bet they are wishing they could make recalls invisible but that is for a different day). It was one of those cars that you pick up at the dealership with little to no excitement and don't bother showing it or telling anyone that you just bought a new car. It is not a bad car, but unfortunately, it is just transportation. My question, or maybe just musing this month, revolves around the question 'Is there a place for the 'invisible' car?' My premise is no. I own a Fiat 500 Pop. Bought it used with 14,000 miles, remainder of the factory warranty and for an unbelievable price. Even new the Fiat is a wonderful car and for an out the door price in low $16,000 dollar range is a lot of value. It is one of the few new cars out there that make me smile when I drive it. I have another car - a 2011 Ford Fiesta - again, bought it used, like the Fiat, new with a realistic sticker price of mid-$16,000 is a great car. Both cars come with all the 'standard' features we come to expect - power windows, power locks, A/C, AM/FM-CD stereo, fancy trip computer, 6 way adjustable seats, bluetooth connection, iPod connection, aluminum wheels - well, you get the point. These cars drive nice. Super fast, no. Sporty, I will say yes. Peppy for around town driving, most definitely. Comfortable - my first outing in the Fiesta was 8+ hours. Nary an ache to be found. 2012 Ford Fiesta 2012 Nissan Versa What else separates these cars or cars produced by Kia, Hyundai, and Mazda that sets them apart from other makes and models? They are not invisible. Kia and Hyundai make some of the best looking cars out there built with quality, in the USA by the way, with a phenomenal and unbeatable warranty. Mazda really does put the 'Zoom-Zoom' into cars and are always a joy to drive. So why do car manufacturers continue to churn out cookie cutter boxes that are boring, uncomfortable and joyless to drive. Cars like the Yaris, really, can they make it much more boring, inside and out? I would easily run into one because they are so bland. The Taurus, Camry, Impala - compare what they look like and drive like compared to the Sonata, Optima, Mazda6 - not even on the same continent. Be careful with the first three listed, you may nap while driving. thinks of cars only as transportation, as an evil necessity, as an appliance. The ones buying the appliances - do they really not care about a nice looking car? Do they dislike driving so much they it just makes no difference how the car handles? If you offered them two cars, same price, same features, same quality and one was nice looking, would they still rather get the non-descript vehicle? I say no, I think it is more about education on car purchasing than just not caring about what you drive. People think that an inexpensive car has to be boring. In the words of the recently passed John Pinnette, 'Nay, nay'. Few cars are, if any, not built with high quality these days - so get out of your Toyota, Nissan, Honda rut and look at other brands. Kia/Hyundai - beautiful cars with the best warranty out there. FIAT - yes, FIAT, makes some great cars and again, great warranty. MINI - I always thought they were overpriced - I now own a Countryman because I decided to look more closely. It was as affordable as any small SUV and a whole lot more fun to own and drive. Buy used - don't be afraid. Remember the cars mentioned above? Most of the used cars you will buy today will have the remainder of the warranty - so little to no risk. Many cars are leased and nothing wrong with them - I just turned in a 2 year old Ford Escape Limited - window sticker of $32K in 2012. 20,000 miles and it will probably sell for $18K with 2 years of warranty left.That's the price of an optioned Yaris. The internet is your friend. Shop high and low, near and far, big and small and...well you get the idea. Maybe that car you love is 400 miles away, so what? Have a fun weekend trip and with the money you save make it a weekend and enjoy yourself. We have CarFax, dealer reviews, E-Bay guarantees and a host of other protections. So you can almost buy a car site unseen. I don't recommend it, but you almost could do that. Of the millions of invisible cars sold, I would have to say only 10 or 15% of the people purchasing them truly say 'I really couldn't care less about what I drive' or even 'I like this car'. The other 85 to 90% just don't realize that a nice looking, fun to drive, high quality vehicle is available in their price range. So take some time, do some shopping and don't settle for the car that you will trip over in your own driveway because you can't see it. Take some time and buy the car you really want. That's the thing about invisible cars, why own one when a fun one is out there? Honda rut and look at other brands. Kia/Hyundai - beautiful cars with the best warranty out there. FIAT - yes, FIAT, makes some great cars and again, great warranty. MINI - I always thought they were overpriced - I now own a Countryman because I decided to look more closely. It was as affordable as any small SUV and a whole lot more fun to own and drive. will buy today will have the remainder of the warranty - so little to no risk. Many cars are leased and nothing wrong with them - I just turned in a 2 year old Ford Escape Limited - window sticker of $32K in 2012. 20,000 miles and it will probably sell for $18K with 2 years of warranty left.That's the price of an optioned Yaris. The long, dark and cold days of February are ahead. Thankfully February is a short month that quickly leads into March giving us glimpses of warm spring days to come fighting winter as the ocean waves fight the beach during high tide. Back in the days when you produced your own food February was a month where little outside work could be done making reflection a possibility. Even in modern days February makes me reflect on the past. As I review the film of my life I realize how many friends I have because of cars that I have owned. The best man at my wedding and I met my sophomore year in high school. My first car, a 1968 Ford Mustang Fastback, would often be parked in the front row of the student parking lot. From my math class you could look out onto the lot and see all of the cars. Unbeknownst to me my soon to be best friend was sitting right behind me. Before class one day he asks: With a lot of pride, By the end of the school year he would be my best friend who I would share many car adventures and my life. He and I are still friends and even though we live 1,400 miles apart we meet annually to watch a race together. After high school I got a job making nearly a whole $15,000 a year so I was ‘pretty rich’. With all that money I bought a slightly used 1983 ½ Dodge Shelby Charger; blue with a silver stripe. It handled like a slot car built with genuine Chrysler quality (i.e. the car ran great but the body and interior fell apart on a regular basis). While out on a drive up a very fun mountain road what should approach but a 1983 ½ Dodge Shelby Charger in the reverse color scheme, silver with a blue stripe. A flash of the headlights and wave and we passed each other. Arriving at the top of the mountain a few minutes later that silver Charger appeared and parked right next to mine. An hour later we were racing together down the mountain and into a friendship that is special to me to this very day. Weekends were spent together, car races attended, passing of cars on the highway one right after the other just for fun and even trying to get license plates that said ‘Hello’ and ‘Goodbye’ so we could pass people to see the look on their faces. A cheap Dodge began a priceless friendship. Fast forward to a new century, a new part of the country taking a new driver to an SCCA teen driver event and a new friend is made. The director of the event, a car guy to the bone who autocrosses so much he has a car specifically for that purpose alone! We chat, we talk about cars and racing, and nearly 4 years later I am still a volunteer in the program and have been made a part of the SCCA family. I have made a good friend that I know I can trust and rely on. A car, a teenager in a Ford Freestyle and a great friend – I would say pretty good event overall. 2011 and my search for my vintage BMW begins. Many posts on the different forums, numerous questions, lots of searches and I run across a very special BMW 1600 with a phenomenal motor and a just downright cool interior! I am interested and call the owner. We talk about the car, and cars, for an hour and soon discover that we have that hard to describe ‘kindred car spirit’. I actually ended up purchasing a different car but my new friend still helped me get the one I bought. Before I knew it we were e-mailing each other regularly, hanging out at the annual 2002 event in Arkansas and meeting up when I am in town. Our friendship has developed over the past 4 years to the point that in the upcoming week he and I are taking a road trip from Dallas to Denver in his beautiful 1973 BMW 2002. An old car makes a new friend, in fact a whole community of friends, in a state I don’t even live in. There are so many other people in my life that stem from my obsession with cars. With limited space I could only highlight a few. I know that it takes more than just a car to become true friends, but a car sure is a great way to find those people. Maybe it is the car spirit or the love of cars but I find that often my car friends are people I trust and rely on after knowing them for just a short time. I admit, I am obsessed about cars. I can’t shut my mind off about cars. I apologize to my friends and family about my inability to not talk about cars. Now as I spend the dark and cold month of February reflecting I wonder, do I love cars? Do I love the car culture? Or do I love the relationships cars have put in my life? It really is all of the above, I just don’t know which one, if any, ranks highest. That’s the thing about a car, this mechanical thing, that I am convinced has a soul, goes beyond simply parts and transportation and becomes a part of your life as it continues to introduce you to new people. No wonder we often sigh, and sometimes cry, when we sell that car that has so many memories that go with it. There are over 50 million people who have fitness center memberships in the United States. Six million of those signups happen in January as part of a New Year’s Resolution. By the time you read this, 80% of those people will have stopped going. Thinking of New Year’s resolutions, fitness centers and our promises to ourselves and others for what we are going to accomplish or change begs the question – What is your plan for your car, or cars, this year? I don’t make resolutions as a matter of habit, is that a resolution? I don’t think that much of New Year’s as a holiday, the 1stof January feels an awful lot like the 31st of December. This year, against my better judgment, I am going to make a few resolutions, related to cars only. I certainly don’t need any improvement, ask my wife or kids…on second thought, just take my word for it. Not only will I make resolutions, I am going to go one step further and foolishly share with all of you those plans. I have two vintage BMW’s. The first, Ivory, is near perfect but after 4 years of ownership and driving her on a regular basis there are a couple of things that I need to do. My second, Ebony, is not quite so nice. She is characterized as one of those blind dates that have a ‘nice personality’ and ‘a lot of character’. She too could use some work. She will never be beautiful or pristine like Ivory, but she can be a driver that others can be envious of. Many of you are looking at the list and thinking. For those of you who think that, I congratulate you on your mechanical skills. You may think I own and manage my own mechanic shop. Well, I am neither, a mechanic nor born with two left thumbs. Somewhere along that continuum is where I sit. Not sure which end but hopefully more to the mechanic side than the thumb side, regardless of my skill level, my plan is to attempt, and hopefully complete, all of the above. Only one issue, it is called procrastination. I admit, I procrastinate when it comes to fixing my cars. I would like to blame it on a busy work and travel schedule, limited funds (which has some truth to it), wanting to spend more time with my family and other well worn excuses. Being an open tool box, I hesitate to start a project because of fear. I am afraid that I will get the car apart and not get it back together. Maybe get it apart and back together but ruin something along the way. Maybe I will only get it half-way apart and get stuck. Finally, I don’t know how to do the job and don’t even know where to start. To get started, I remind myself, short of just a bolt and a nut going together, most work performed on a car, much less 40 year old cars, will not be easy. Maybe some bolts will get rounded. Maybe make a scratch. Maybe I will have to take it apart again because I did something wrong. In any case, the first time I attempt something more complicated than changing brakes, plugs and oil, there is a high chance that I will take something apart and it won’t come apart, I will break it or it won’t go back together. Then just dig in! As I try more things and attempt difficult projects I am learning that few things are irreversible. If I strip threads, well they make something to fix that. Break off a bolt, drills and other tricks easily fix the problem. If I can’t get something together, the internet, YouTube, and friends are wonderful sources of information and help. Working on and finishing cars shouldn’t be, and is not, as scary as your mind and soul might think. For my mechanic friends out there, I know this sounds simple, but for those of us who are not so good with tools attempting a big job on a car is intimidating but going in with the mindset that anything can be fixed gets you a long way! Go out there and fix those cars, start those projects, help each other out and hold me accountable to my own goals. Finally, the same is true with life. Not everything will go perfectly, most things will fail the first time, and often goals are hard to reach, but go out and try anyway. Just like cars, there are few things that can’t be fixed and I find as I tackle more projects on my car I tackle more things in life. That is the thing about cars, they can impact your life more than just getting you places. So where were we – that’s right, on my way home from Pittsburgh to Birmingham, AL on a cold and rainy day. But no stinkin’ rain can dampen my spirits – I have a 79 Mercedes convertible to bring home. The rest of the trip is what one could call many things. Exciting? Strange? Frustrating? Twilight Zone? You pick the description, each and every one is true at some point along the way. 5:00 PM I return my rental car at a Hertz Local Edition where they normally will give you a ride back home, etc. Notice the word normally in that sentence, that is the key word. 6:15 PM 75 minutes later, now 6:15 the rental place closed, I stand out in the cold and no taxi yet – and I don’t know the name of the cab company. I call the garage and they can pick me up. 7:00 PM Two full, very full and cold, hours later the cab shows up at the same time as the garage owner. I tell the taxi guy to get lost, he is not happy, and I hop in for the ride back to my little, light yellow pot of gold. Put on the illegal temporary plate (Pennsylvania frowns on those) I get in, start the car, it is running, it is comfortable and while the dashboard lights don’t work, nor the heater, this still will be fun. 7:20 PM All goes great for the first 1.5 miles. Road construction, stopped traffic and the low gas light comes on. I ain’t gonna make it, I will run out of gas. 2 miles, 25 minutes later I get to an exit with a gas station. Whew, dodged that bullet. In my ever optimistic car mind that must be the only difficulty I am going to experience and the rest of the drive is going to be oh, so cool. As the late John Pinnette used to say ‘Oh, nay, nay’. 11:48 PM 183 miles later I am driving past Sutton, West Virginia – don’t know where that is? Neither did I, heading towards Gassaway, West Virginia – again, never heard of it but I know it now. The big Mercedes has a top speed of 15 miles an hour. With 600 plus miles to go, I am thinking that just maybe I might not make it. 11:53 PM Sure enough, 3 miles later, my beauty is dead. Taps play, I look up at the stars in the dark, dark sky and realize ‘I’m stuck’. That AAA Gold Membership is worth every penny so I call. 11:55 PM Because of my Alabama phone number, AAA rings to Alabama first. Actual conversation follows. Long pause Not a problem. About 8 minutes later when no one has picked up and I have listened to music, heard the complete history of AAA, all of the advantages of being a member, new special rewards and how to raise my child, in real time, in triplicate, I realize that no one is going to answer. 12:04 AM So I call again. That is very nice and I accept the offer. 10 minutes later AAA picks up making the transfer complete. Long pause. Say it with me now. Somehow I knew that she was going to say that. 12:15 AM It is now about 12:15 and I haven’t even spoken with a AAA person yet. I start the car with hopes that maybe ‘car heal thyself’ comments have worked – she starts – maybe I can make it - but as soon as I go into gear she begins to bog down. AAA is my only answer. Finally, someone says I wanted to say ‘The West Virginia?’ but I kept my mouth shut. I describe where I am, she is going to dispatch a tow truck which will be there within 45 minutes. Then the 5 minute later call from AAA. It is not what I say but I think it real hard, probably hard enough to be heard over the phone. I describe my location and am told that a tow truck will be dispatched soon. 10 minutes later I get a call from the towing company. They ask. Again, I do not say that but I think it, real, real hard. I describe yet again where I am and the owner says I have no clue and tell him that which seems to satisfy as a response. 1:10 AM 45 minutes later, no truck has shown up I call back. A groggy dispatcher says OK, what else can you say? Send a medflight? 1:25 AM I get a call. Hmmm, tough one, it might be because I am at exit 57. I am nice on the outside but something tells me Satan is rubbing his hands as I speak. I know it is not this guy’s fault. 20 minutes later he is there and loads up my retirement fund. She actually looks good on the flatbed truck, I honestly think that. 20 minutes later we arrive at the Microtel in Gassaway. 1:50 AM Nice woman behind the counter sees me with the tow truck driver and asks And she looks at and I realize she thinks the tow truck driver is sharing my room. He quickly comments that it is just me as he is the one towing the car. He stays to make sure I have a room, tells me where he is towing the car and heads out. 2:00 AM I get my first key to a room on the first floor. First key you are thinking? Yes, actually the first of 4 room keys. My first room opens into a dirty room. The former residents looked like they kept it neat so maybe I will just stay (NO I would not do that, but the thought did cross my mind at 2:00 AM). The second key to a new room didn’t work at all. I get a third key to my second room – yep, it doesn’t work either. A third key to my second room, you guessed it, it doesn’t work either. Finally, on the fourth trip to the lobby she gives me a new room and a new key and I can go settle in. Before sleep can happen I have to see how I can get to an airport and then get home. The Charleston Airport is about 60 miles away and they have a reasonably priced flight that leaves at 2:00 in the afternoon. Perfect, I book the flight. 2:30 AM Find a car service. I try three different websites, enter all of the information and all three say ‘No taxi or shuttle service available, will a horse and buggy do? Have you considered hitchhiking?’ Alas, it is true, no taxi, shuttle service, limousine or anything where one can pay a driver to take one somewhere. 2:45 AM A one way rental is the only option. I look for the nearest Hertz – the site laughs out loud at me. The nearest Hertz is 60 miles away. So I would need a car to get the car that I need, that doesn’t sound like a plan. Panic sets in. About 3 miles away is an Enterprise rental agency – I log onto the site, book my car, get my reservation confirmation and I am now all set. I can actually get home and worry about the Mercedes when I get home. 6:30 AM I wake up and plan my day. First call to Enterprise to get a ride from the hotel. They don’t open until 9:00. That’s OK, I have plenty of time. So a nice shower, downstairs to grab some breakfast, do a bit of work and watch some TV. All of that should be possible, except, the internet is down and the ceiling mounted TV that I cannot reach has no remote. Oh well, just bad news anyway. As I write out my last will and testament, a note for my wife and three children telling them how much I love them, wish I was a better dad, and wish them a wonderful life, I think that maybe the garage where the car is located might know how to get me to the airport. Skeeter answers the phone. Yes, Skeeter. I tell him I am just going to leave the car and have it shipped home and is that an issue? I get a call a few minutes later from my co-worker, who was supposed to go home the day before, asking me how the trip is going. I tell him everything and he happens to be driving right past Gassaway and can bring me to the airport. If that isn’t divine intervention I don’t know what is. And a good thing too, Skeeter calls me back and tells me. The hotel that is 1.5 miles away? That one? Fortunately I tell Skeeter that I actually have a ride and thank him for his help. An hour later I am with my co-worker, in a brand new rental, heading to Charleston airport for a flight home. Maybe Stephen King can write a book about this? Oh, he did, it is titled ‘Misery’. So that is the thing about chasing after cars, what they do on TV, ain’t, I mean, isn’t, anything like it is in real life. It was the best of times, it was the worst of times. Mr. Dickens penned those words over a hundred years ago and for many of us this happens on a regular basis. My story for the next two months is just like that, the best and worst of times, rolled into one. Unfortunately, more the worst of times but with the rose colored glasses perspective of the best of times. Please enjoy my journey with me. Wayne Carini of Chasing Classic Cars, Jeff Allen and Meg Bailey from The Car Chasers, the Gas Monkey guys from Fast and Loud are all becoming household names, at least in those homes where someone who is infatuated with cars lives. The premise, find a car that is under-priced, buy it, fix it up and sell it on for a profit (That's how they say it on Wheeler Dealer). Usually this is because someone doesn’t know what they have or the car is solid and straight but needs a little bit of work or just because it is so cool it must be worth more than I am going to pay for it. Soooo…go get it! All these shows make it looks so easy. Jeff Allen will offer a person 25% of their asking price and suddenly he and the owner are only $1,000 apart. Wayne gets the car home and his mechanics use a little WD40 on an 80 year old engine, put in some gas and voila – she starts and runs perfectly. Fast and Loud – I think theirs is mostly luck, but they seem to be lucky a lot. I think if they can do it then someone like me who sells million dollar software systems and used to sell cars can certainly do the same thing. It will be like cheating as I not only rake in the cash but also have television networks wanting to make a show about my skills. And, it is all true. All, except that it being easy, bringing in the bacon and networks smashing down my door to sign me up for a 10 year show with a sign on bonus of $10 million. Other than those few things all of this is the complete, swear on the Bible, honest to goodness truth. Reality for the other 99.99999% of us is different. Six, or was it 9 or 10, months ago a colleague is selling her 1979 Mercedes 450SL in light yellow. You know the under-priced, perfect car. It grew up in the Southwest, never has seen rain, pampered for years with only 65,000 miles and made of unobtanium. All this for a price that is about a quarter of the price of one that I wouldn’t let park in the same garage as this one. However, the car has sat, and sat, and sat so it isn’t quite as beautiful anymore. Hoses are cracking, air conditioning only blows cold in the winter and while pretty rust free the beauty isn’t what it used to be. Now she looks more like the prom queen at her 35th high school reunion who has been married 3 times and smoked more than one cigarette. Nice looking but no longer stunning. But hey, pay you no mind to all of that – the car is cheap. I mean like really cheap (see the definition of really cheap later) so I can buy it, fix it up, and keep it or turn around and sell the car and make enough profit to pay for my childrens’, grandchildrens’, and great grandchildrens’ college funds plus purchase that beautiful lake house I have been eyeing. (Okay, in reality, I just want to make enough to put some nice parts on my other cars and try to restock the quickly depleting college fund.) I buy it, sight unseen, pictures only and the word of the mechanic who took care of the car for the last couple of years, and by caring for, he stored it. I tell the owners Their reply, after a long silence. Such nice people. I say OK and send on the check. Meanwhile the Lost in Space robot is yelling ‘Danger Will Robinson, Danger’. Oh, shut up. Six, or was it nine or ten, months later I happen to be flying for work near where the car is located and it is ‘ready’ to be picked up. All fluids changed and itching for a long drive. I did have to put in a new temperature regulator flux capacitor and replace a bad fuel injector and something else. Yada, yada, yada – just give me the damages and I will take it home and retire. A $2,700 ‘getting her ready’ check and my trip home begins. http://thethingaboutcars.blogspot.com/2014/09/the-thing-about-car-bug-and-turning-50_53.html By the time you read this I will have hit a very major milestone in my life. I will cross over the half-century mark. I know when I turned 40 just last year, or was that 10 years ago? I was shown the secret handshake for those that are four decades old. No one has told me what secret comes with turning 50, maybe just getting to 50 in one piece is the secret in itself. They say you are as old as you feel - who knew that 100 would feel so good! Enough about my age - 46 years ago I was bitten by a bug. It's venom has no known cure and continues to ravish my body with no bounds of decency. I remember the day as if it was yesterday. 46 years ago, I was 4 years old (yes, 50 - 46 is 4, I have that much of my mind) and it's late summer, one of those perfect evenings with the sun just setting, crickets beginning to chirp, an evening that can only be found in Vermont that time of year. My friend's older brother just purchased a used, new to him, red on red 1964 Chevrolet Impala SS. He pulled up to their house and there it sat, gleaming, almost glowing, in the early evening dusk. The red paint seemed two miles deep. The white band down the side screamed 'I am fast, very fast' and I remember staring at the chrome SS logo on the rear quarter panel thinking that it was alive and rumbling like the engine up front. The red interior, center console and the beyond describable chrome insert in the back seats set my heart to fluttering. my face went flush and I just stared. Nothing in the world had ever been so beautiful. I mean I always liked cars, Matchbox, Hot Wheels, remote control, battery operated, but that day -- that moment - I was infected with the real car bug and the fever has never subsided. I know people often write about what it means to be a 'true' car guy, or girl. I am writing today to say that all that is written is true. As I have grown older my affliction only worsens. My wife, my children, my non-car friends have to live with my obsession. Walking through a parking lot and seven rows over I spot the roof or maybe a small part of the trunk of a cool car and off we go, all walking over to see the car that dad says is cool. Why? They don't know, but dad says it is. 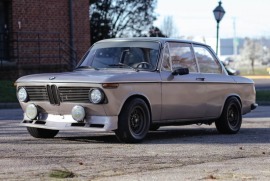 I drive a BMW 2002, a box on box design and think it is one of the sexiest cars ever made so clearly what it means to be a cool car is different in my mind. I have shared with my wife that I wish I could shut off my car brain. I wish there was a cure because I know it is difficult for those that I live with and around. I have tried to starve the disease and feed the fever and vice-versa -- nothing works. While driving I see every car that goes by and comment on most of them. While at home Velocity or NBC Sports Network channels are on the television and as for the recordings on my DVR, it is at least 4 to 1 cars over everything else. Races, car restoration shows, car information shows, car shows about car shows, auctions - it makes no difference, if it is on I will watch it. Sometimes when I am 90 minutes into a 3 hour race I realize that my family has had to listen to roaring engines for the entire time and I feel bad. I watch auto auctions, Mecum, Barrett-Jackson, Joe’s local car, tractor, boat and lawn mower auction, really any auto auction that is on. Again, hours of the auctioneer crying out 'Who will give me 55, 55, do I hear 60, 60' and I think to myself, 'This is not fair to my family'. But, I simply can't change the channel. For those of you who live with and put up with the truly car obsessed you deserve medals of honor, purple hearts, and other lofty awards for your service. It isn't easy but you bear with us even when we should have been ignored hours, really, years earlier. My own wife, Cathy, and my children, Ethan, Eliza and Seth, thank you for allowing me to babble on about cars, have two in the driveway that are twice the age the children with a third car on the way. You have allowed me to be me and have never complained - thank you. Please know that if I could control this demon I would, but it runs free and I am powerless to stop it. For those of you who are car obsessed with a significant other, family, friends, you too need to thank them. Go ahead, do it right now, I can wait. To us knowing that a 67 Mustang did not have side markers but a 1968 did yet forget your anniversary or your child’s birthday seems totally normal. Dear car friends, it isn’t. We owe it to the rest of the world recognize that. Did you say thank you yet? Did you give them a big hug? That's all you can do. Now, go back to the garage and get working. That's the thing about the car bug, you don't know who it will strike, but when it does, there is no cure and the beast must be fed. service. It isn't easy but you bear with us even when we should have been ignored hours, really, years earlier. My own wife, Cathy, and my children, Ethan, Eliza and Seth, thank you for allowing me to babble on about cars, have two in the driveway that are twice the age the children with a third car on the way. You have allowed me to be me and have never complained - thank you. Please know that if I could control this demon I would, but it runs free and I am powerless to stop it. James asks how in the world could a boring sedan be the fastest car in the world? Mr. Clarkson exclaims 'It's a rental!'. From that point forward the little car never had a chance. So it is true with all rentals, they seemingly live the life of a London cabby horse in the late 1800’s. As we conclude our series on rental cars I am here to share the plight of these vehicles. I am not talking about just Mustang GT's and Camaro SS's but even the little Toyota Yaris or the huge Chrysler Town and Country mini-van that have been treated in ways as people say 'I wouldn't treat my worst enemy like that.' I imagine as cars come off the manufacturing line and think with joy about their future owners some Taurus or Impala reminds them 'You could become a rental'. It is then the nightmares begin. How do people treat rental cars? A few, like me, call us One Percenters, actually treat them well. My love of cars doesn't allow me to trash, beat on, dirty or do anything else that plagues how these poor beasts are treated. Maybe one standard deviation from me are those who just get in the cars and drive them neither caring that they are rental cars, or cars at all. A ding? No worries. Food on the floor? So what, the Avis people will clean it up. They generally don't misuse the vehicles but definitely have no issue leaving a rental in a tough neighborhood - unlocked. There is a larger group who believe that a rental car is synonymous with 'garbage truck'. This group is generally comprised of families but a single salesperson living the jet set life of fast food, 84 ounce sodas from Shell stations can also fall into this category. These poor cars return after a week at the beach with enough sand to fix slippery roads for the city of Atlanta during an ice storm, enough dirt to plant potatoes and other root vegetables and enough garbage to keep Wall-E happily employed for a thousand years. How this is done in a single week I don't know but these renters seem to accomplish this without breaking a sweat. I am positive I once saw a bucket loader at the back of a mini-van helping to unload more trash than early Native Americans would make in a lifetime. The remaining 85% of the people get in their beast of burden and suddenly think they are Jeff Gordon or Jimmie Johnson. Behind the wheel they are at the Coca Cola 600 in Talladega and dang it, they are going to win. This type of driving behavior is regardless of location, weather or, scarily, driving skills. They drive like this in town or on the open road believing the right hand pedal must be to the floor while simultaneously slamming the brakes till they become molten pieces of metal dripping beneath the car at each and every traffic light. The phrase 'Drive it like you stole it' is their mantra. What's funny about the 85 Percenters is they do this no matter what kind of car they have. A mini-van - well it has one of those auto-manual shifters so they must want me to jam it in and out of gear. A Nissan Versa - the engine is so small I have to run it to 9,000 rpms just to get to the top of the hill (by the way, the car red-lines, which means that is the SAFE maximum engine revolutions, at 6500). We all know a Taurus can easily drive over the largest speed bump at 40 MPH and the little Chevy Cruze – ‘Pot hole? What pot hole?’ as they careen the vehicle through Neil Armstrong’s lunar crater the same way Grave Digger drives over other trucks. Do I need to mention what happens to Mustangs, Challengers, and Camaros? Let's not go there, I just had breakfast. Why though? Why only rental cars? People don’t annihilate tools they rent from Home Depot or from a neighbor (I do have a story about weed whacker that came back after a day’s use in let’s say less than pristine condition). This doesn’t seem to happen to vacation rentals. Even people who rent apartments and houses tend not to destroy them simply because they can. In fact, in other rental situations it is One Percenters who treat other rental objects roughly while the other 99% are respectful. That about sums up the fate of the rental car. So how do you treat your rental cars? Never mind, I don't think I could handle the answer. As one who loves cars and thinks of them as having a soul, it is difficult to sit back and watch the hopeless life of the rental car. I am thinking of starting my own non-profit – PETRC – People for the Ethical Treatment of Rental Cars. That’s thing about rental cars – just as people never say ‘I want to grow up to be a jerk’, no car comes out of the factory wishing it will one day join a rental fleet. http://thethingaboutcars.blogspot.com/2014/07/the-thing-about-rental-cars-part-2.html A new car is exciting and there is something about the new car experience that only a new car provides. The smell of new leather (or leatherette?). The thunk sound of a solid shutting door. The smell of the engine, heater, air conditioner as they reach maximum operating temperatures for the first time produce a magical experience. The issue for most is that the experience comes once every 4 or 5 years. More frequently for those with 6 or 7 digits in their savings account balance.Even then for most it is a rare event. In enters the rental car. If you travel a lot you get to experience a new car each and every week, sometimes 2 or 3 in a single week. While all of the cars are not brand new most of them have fewer miles than the one back home. Last month we discussed they types of cars to rent. This month let’s focus on the excitement, or, the lack thereof, of the actual car you get when you arrive at your destination. My company uses Hertz as our primary rental company. I generally rent a mid-size, or standard car. Remember, this is a 4 door compact with 5 seat belts. Go with a full-size and you are looking at the general family / co-worker hauler. Regardless of category some cars are almost fun and some coma inducing. A Maxima or Kia Optima turbo or a high end Hyundai for a couple of days can be fun as they have enough horsepower, and gadgets, to make the driving at least entertaining. You also may be punished with an Impala or an Altima that lack gadgets and horsepower and essentially represent cars where the engineers are told ‘This year, make the car 10% more boring and if you can hit 12%, bonuses all around!’. Let’s not focus on the actual brand of car but instead on the feelings you experience as you get off the plane. You may be picturing yourself in a Mercedes SLS roadster driving down the highway with the top down , sun shining and the wind blowing through your hair (hey, it’s my imagination and I am allowed to visualize myself with hair!). Since I generally rent in the same category I generally get the same cars. A Ford Fusion (which is nice), the Toyota Camr…(oh, sorry, fell asleep there), most often the Chevrolet Impala. After I land I get an e-mail from Hertz telling me what my rental will be. Often I won’t even open the message. I like to wait until I get to the rental agency itself so the surprise lasts longer. I look at the Gold Club board to see what slot my car sits in. As I stroll to my space I look at all the cool cars I pass getting to mine. I dream that maybe, this time, I will I get a Mustang or Camaro or maybe something from across the ocean like a Volvo or maybe a Mercedes. As I continue down the aisle I anxiously peek over the top of the of the other vehicles looking for my car. Being honest, I also hope I won’t actually see my car because, like birthday and Christmas presents, once I know what the gift, or the car in this case, is, the anticipation and surprise is over.My car may be 4 or 5 aisles over and as I pass fun little Fiats or Kia Souls or some other model that I have never driven I assume they will be more fun than my rental. As I near slot 761 and still my car remains unseen between the two ginormous SUVs my anticipation grows. If it is between two expensive to rent Super-size Me’s it must be nice, right? I see my name on the board above the car. This baby will definitely be mine and what do I find, blazing forth in its full glory? A, wait for it, the car I have been anxiously wondering about since the reservation was made two weeks ago. It is, it is… A tan Camry. Yep, that’s right, tan and Camry. Two of the most unexciting words in our language and when put together multiply the dullness by 263 -- Yes, I have calculated the boringness factor of those words combined and 263 is correct. Sigh… Maybe not all is lost? Maybe the car is top of the line! Yes,that’s it, definitely top of the line. I look for the telltale signs that spell ‘F-A-N-C-Y’. Aluminum wheels? No. Extra chrome? No. Body colored bumpers? No. Still not hopeless, maybe the money was spent on interior features. I open the door looking for tan leather, moon roof, built-in GPS, and a digital dash. No, no, no and no again. The tan cloth interior, analog gauges, manual AC/heater controls, and radio with 6 whole buttons to push face me with almost the same gloom that I feel. Sigh again…I look back across the garage and there, just 4 stalls over, a Hemi Charger. A Cadillac SRX and a bright orange Challenger just two rows over and all, so close, yet so far. Maybe there is something better in the Gold Choice area? Maybe I should go back and see what else they have available? But my spirit is broken, I have opened a black belt and socks as my Christmas gift. With depression at 110% I give up and load my luggage into the trunk, climb into the driver’s seat, and drive away. Even the Camry seems sad to be a Camry. I pull out of the lot, popping Benzadrine to remain conscious and I realize that at least I don’t own this car and it is only for a couple days.Besides, I am traveling to Dallas on Thursday. I fondly remember the Camaro SS convertible with only 6 miles on the odometer that once awaited my arrival. Imagining my Camry is a Ferrari I smile -- almost. That’s the thing about rental cars, getting the one you really want is like dessert at a church pot luck, sometimes it is Sinful Chocolate Decadence and sometimes it is red jello with beets.